The previous government’s sudden ban on live cattle exports destroyed a longstanding assumption by the Indonesians that Australia could be relied upon for its food security. Given our proximity and large cattle industry, they thought there was no risk they would ever run out of beef. The Indonesians are now demonstrating they don’t trust us by seeking to invest in cattle properties in Australia. Their thinking, fairly naturally, is that this will reduce the risk of being denied cattle in future. Quite frankly, I don’t blame them. Moreover, I hope they force both our farming industry and the government to face up to a couple of matters that they would rather avoid. The first of these is the matter of foreign investment. The government is currently split between those who favour free trade and foreign investment, Treasurer Joe Hockey among them, and those who want it restricted, led by Nationals Barnaby Joyce and Fiona Nash and Liberal Bill Heffernan. The other is the obligation imposed on live cattle exporters, known as Export Supply Chain Assurance System (ESCAS), to guarantee Australian animal welfare standards are maintained through to slaughter despite exported cattle being located in Indonesia and owned by Indonesians. I previously discussed foreign investment in the context of the report of the Senate Standing Committee on Rural and Regional Affairs into grain handling, specifically Archer Daniels Midland's (ADM) takeover offer for Graincorp, to which Senators Heffernan and Nash were chief contributors. That report, relying on little more than bizarre conspiracy theories, decided foreign investment had the potential to “distort our capital market to the detriment of Australian farmers and Australia’s economy due to food security concerns”, and should be subject to scrutiny “to protect the public interest and the interests of grain growers”. So now we have Indonesia proposing to purchase up to 1.5 million hectares of Australian cattle country in an attempt to increase its own food security, for which it requires a reliable supplier of beef. Australia’s food security, as it happens, is not even vaguely at risk. While northern cattle producers have largely welcomed the proposal, which can be expected to inject some much needed confidence into the industry, new Agriculture Minister Barnaby Joyce has already indicated his opposition. I imagine Nash and Heffernan feel the same. Indonesia is a large, very populous and mostly Islamic neighbour. No sensible person would want Australia to be anything other than a good neighbour. Moreover, Australia badly needs Indonesia’s cooperation if it is to stop the flow of unauthorised refugees arriving in boats. For those opposed to its investment in cattle farms, awkward barely describes it. So let’s consider the fears of those who oppose foreign investment. What is the worst that might happen? Most likely, cattle running on Indonesian-owned properties in northern Australia would be shipped off to Indonesia for fattening or slaughter, much the same as they are now. There is probably not much chance they would be exported to another country or sent south for slaughter. The properties would continue to employ Australian managers and station hands and purchase their goods and services in Australia. Foreign ownership does not come with a licence to import these. Employees would continue to pay taxes and, assuming they made a profit (which many northern cattle properties do not currently), the property owners would pay Australian company tax. If they tried to avoid tax by selling the cattle at below market price to their Indonesian counterparts (known as transfer pricing), the tax office would be all over them like a rash. It has heaps of experience at dealing with that kind of thing. Would 1.5 million ha, capable of running around 50,000 to 100,000 head and turning off not much more than a third of these, crowd out other producers? Well, no. Indonesia needs at least 500,000 cattle each year and some suggest natural demand is 800,000. Would it mean a risk that Australia might run short of beef? No again. Australia already exports almost two-thirds of the beef it produces, not counting cattle exported live. Would it mean our capital markets were “distorted”? If distortion means giving a minor boost to top end property values that enable a few struggling Australians to get out of debt, perhaps there should be more of it. An estimated 30 per cent of north Queensland and Northern Territory cattle properties are currently for sale. And the big question is, would it be contrary to the public interest? That’s harder to know because nobody really knows what it means. You’d probably have to ask Senators Nash and Heffernan, or Barnaby Joyce, to know for sure. But I suggest it is undoubtedly in the public interest. Here’s why. First, it means Indonesia will not look to countries like Brazil or Argentina for live cattle, or relax its quarantine standards to allow boxed beef imports from India, as was widely feared in 2011 when our government slammed the door on exports. As demand for beef grows in Indonesia, Australian production will grow with it. When a customer invests in its supplier, you can be pretty sure it doesn’t intend to take its business elsewhere. Second, it will add to the common interests between Australia and Indonesia. We need Indonesia to have an interest in our country and to care what we think. We will need their goodwill in spades if the flow of boat people is to be stopped. And finally, it might help prevent our government from getting too big for its boots. Applying our animal welfare standards to an Indonesian firm operating in Australia is one thing, but telling them what to do in their own country is another. I envisage some of the bossy arrogance inherent in ESCAS might be quietly wound back. If buying some cattle farms helps the Indonesians to lose some of their well justified mistrust of us, I say let them. It’s in our national interest. By David Leyonhjelm who has been an agribusiness consultant for 25 years and was recently elected to the Senate. 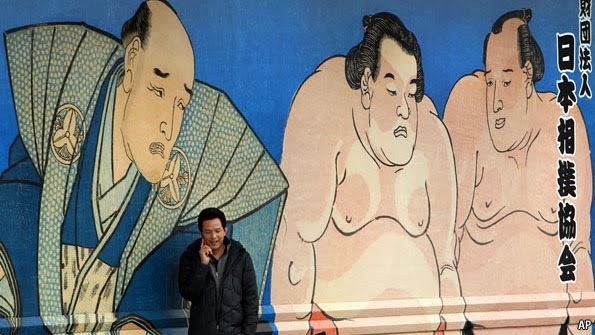 The announcement that Tokyo is to host the 2020 Olympic Games was given much publicity. After all, that sort of thing is what so many people are interested in these days - the grubby glamor of sport and "celebrities". The fact that a footballer or undressed actress gets more cash per week than a cancer surgeon earns in a year attracts hardly a word of media criticism because, after all, celeb worship sells the product. International comment on the choice of Tokyo has been mildly supportive, just as it was when Japan announced its whopping military budget in August. The country will spend US$49 billion on its armed forces next year, the fifth-largest military budget in the world. Yet as most media yawned gently and carried on highlighting celeb vulgarity, consideration as to what Japan's military intentions might be was missing. [T]he Japanese people forever renounce war as a sovereign right of the nation and the threat or use of force as means of settling international disputes. To accomplish the aim of the preceding paragraph, land, sea, and air forces, as well as other war potential, will never be maintained. The right of belligerency of the state will not be recognized. This was and continues to be regarded as a most satisfactory state of affairs because it means that under present constraints Japan will not again be capable of invading any other country; a nasty habit throughout the first four decades of the 20th century. It was hoped - and still is by very many people - that the Japanese constitution presents, for the moment at least, a decisive counter to any such ambition. In spite of being specifically forbidden to possess war potential, Japan has a "self-defense force" of considerable strength. Its quarter of a million personnel in the air, ground and sea components operate much the same equipment as do the air forces, armies and navies of other countries. It has tanks and artillery and over 300 fighter aircraft as well as 350 maritime support aircraft, 40 major and well-armed surface combatant ships, and 16 submarines. Not bad for a military organization that is constitutionally forbidden to go to war. But it has no bombers or long-range attack missiles - yet. In December last year Abe's Liberal Democratic Party came to power. Its lack of liberality was highlighted in April when Abe was asked in parliament if he supported the statement in 1995 by then prime minister Tomiichi Murayama to the effect that Japan apologized for invading all the countries that suffered its savagery in World War II. It was obviously a planted question, and Abe's answer had been prepared in advance. He replied blandly that "The definition of what constitutes an 'invasion' has yet to be established in academia or in the international community," which assertion is as foolish as it is insulting to the memory of countless millions who suffered the brutality of Japanese invaders for so many years. Abe continued, "Things that happened between nations will look different depending on which side you view them from." That's true, of course - but there is no doubt that in 1910 Japan invaded Korea, whose citizens were subjected to brutal repression until Japan's defeat in 1945 forced its withdrawal. And there is no question, either, that Japan invaded Manchuria in 1931, and from there prepared its further conquest of China in 1937 which involved, among other appalling atrocities, the Nanking massacre of over 200,000 people. After attacking Pearl Harbor in 1941 the Japanese invaded Thailand, Malaya, Burma, Borneo, the Philippines, Java, Sumatra, New Guinea, the Solomons and other Pacific Ocean islands. It is intriguing to try to imagine from "which side" Abe imagines these countries might regard Japan's actions, even in forgiving retrospect. But there was another aspect of Japanese imperialism that the prime minister chose to highlight. In the course of its war preparations in the 1930s, Japan formed Unit 731, a biological and chemical weapons research and development organization whose evil experiments killed thousands (we'll never know the exact number) of Chinese, Koreans and Russians, and who knows how many others. And it is horribly coincidental, given what has been happening in Syria, that Prime Minister Abe arranged a photo opportunity in May that commemorated Unit 731. In a ghastly display of crass, callous and grinning arrogance, Abe gave the cameras a thumbs-up sign from the cockpit of a Japanese "Self-Defense Force" jet aircraft that prominently displayed the number "731". This is the man who is currently leading Japan and who wants to have his country released from its constitutional prohibition against creating an offensive military force rather than one that is, quite rightly, focused most effectively on self-defense. One reason for his determination to destroy the commitment to "forever renounce ... the threat or use of force as means of settling international disputes" is because he wants to confront China militarily over Beijing's claims to islands in the region. If he succeeds in his aim, he will be able to equip his armed forces with advanced offensive weapons and go to war. Indonesia’s Deadly 13th-Century Volcano Eruption: Mystery Solved? 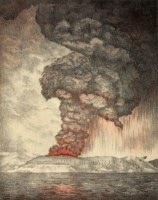 The 1257 A.D. explosion was eight times stronger than Krakatoa (pictured). One of history's great disaster mysteries may be solved—the case of the largest volcanic eruption in the last 3,700 years. Nearly 800 years ago, the blast that was recorded, and then forgotten, may also have created a "Pompeii of the Far East," researchers suggest, which might lie buried and waiting for discovery on an Indonesian island. The source of an eruption that scattered ash from pole to pole has been pinpointed as Samalas volcano on Indonesia's Lombok Island. The research team, led by geographer Franck Lavigne of the Université Paris 1 Panthéon-Sorbonne, has now dated the event to between May and October of 1257. The findings were published today in the Proceedings of the National Academy of Sciences. "It's been a long time that some people have been looking," said Lavigne. After glaciologists turned up evidence for the blast three decades ago, volcano experts had looked for the origin of the eruption everywhere from New Zealand's Okataina volcano to Mexico's El Chichón. The previously unattributed eruption was an estimated eight times as large as the famed Krakatau explosion (1883) and twice as large as Tambora in 1815, the researchers estimate. (Related: "Tambora: The Greatest Explosion in History.") "Until now we thought that Tambora was the largest eruption for 3,700 years," Lavigne said, but the study reveals that the 1257 event was even larger. To solve the mystery, the multidisciplinary team paired known clues with new radiocarbon-dating results, volcanic ejecta chemistry, stratigraphic data, and historical writings. "This eruption was known by many different disciplines, many researchers," Lavigne said, "but the main problem may be that they worked individually. I think this is a key point for work on other eruptions. We had geologists, geochemists, geographers, historians, radiocarbon-dating specialists, and many others—all these researchers from different specialties to combine facts." The cataclysm blasted 10 cubic miles (40 cubic kilometers) of debris up to 27 miles (43 kilometers) high into the sky, producing fallout that settled around the world. Near the volcano itself, it settled into thick deposits that the team sampled in over 130 places to produce a stratigraphic and sedimentologic picture of the way the eruption unfolded. Further afield, the volcanic sulfate and tephra became locked in ice core samples taken from both Greenland and Antarctica. The eruption's geochemical "fingerprint" was uncovered two decades ago, Lavigne said. "We started with the ice cores," he said, "and we know from the [distribution near both poles] that the eruption was tropical." That narrowed the field further. Ecuador's Quilotoa did produce a massive, caldera-creating eruption in roughly the same time period, and an enduring caldera much like the massive example at Segara Anak—but the findings from the ice samples ruled it out. Geochemical composition studies of glass shards found in both the Greenland ice sheet and Antarctica are much less of a match for the glass chemistry of Quilotoa tephra—but a very convincing match for Samalas glass. "This just shows that there is a lot we don't know about volcanic eruptions, even what may seem like basic questions about some of these very big eruptions," said geologist Ben Andrews of the Smithsonian Institution's Global Volcanism Program, which maintains a public database chronicling 10,000 years of volcanic eruptions. "This international team of scholars did a huge amount of work to help us understand this one." Though the eruption was equatorial, its impact was felt and noted around the world. "The climate was disturbed for at least two years after the eruption," Lavigne said. Evidence of this was found in studies of tree rings that revealed abnormal growth rates, climate models, and historical records from as far afield as Europe." Medieval chronicles, for example, describe the summer of 1258 as unseasonably cold, with poor harvests and incessant rains that triggered destructive floods—a "year without a summer." The winter immediately following the eruption was warmer in western Europe, however, as would be expected from high-sulfur eruptions in the tropics. The team cites historical records from Arras (northern France) that speak of a winter so mild "that frost barely lasted for more than two days," and even in January 1258 "violets could be observed, and strawberries and apple trees were in blossom." In Indonesia records describe a catastrophe of a far more destructive and immediate sort. Found written on palm leaves, the Old Javanese texts of the Babad Lombok describe a massive volcanic blast that formed a caldera at Mount Samalas, on Lombok Island. The writing describes the deaths of thousands of people due to deadly ashfall and pyroclastic flows that destroyed Pamatan, capital of the kingdom, and surrounding lands. While the records did not list an exact date, they narrowed the field considerably by stating that it took place before the end of the 13th century, lining up the historical record with the scientific evidence of the eruption. Andrews noted that actual descriptions of such an enormous eruption are extremely rare because such eruptions happen only about once every 600 years. "This kind of chronicle could only be written if one of them happened near enough to where people were writing the records but not so near that the eruption clobbered them," he said. In the case of Samalas, a far more tantalizing physical remnant than texts could await discovery—the ancient Lombok kingdom's capital of Pamatan, perhaps buried by the enormous blast. "Pamatan might represent a 'Pompeii of the Far East,'" the study authors note, but in what condition is anyone's guess. Starting Oct. 1, in a worst-case scenario, bankers and listing professionals could be put behind bars for their role in public listings in Hong Kong, up till recently a top capital-raising center and magnet for initial public offerings from Chinese companies. To top it off, the current clampdown on data and corporate investigations in mainland China further complicates the situation. The controversy stems from measures announced by the Hong Kong Securities and Futures Commission in December 2012 to step up the regulatory regime for listing sponsors, including clarifications of their liabilities - up to civil and criminal liabilities - to be put into effect Oct. 1 this year, and will apply to all public listings filed from that date. These measures supplement the new listing rules previously announced by The Stock Exchange of Hong Kong to promote more extensive and thorough due diligence of listing candidates. 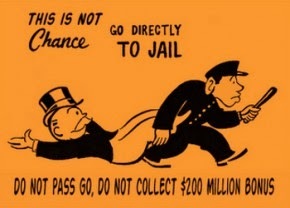 Specifically, according to the SFC, any untrue statement found in the listing prospectus and resulting losses for investors would mean the directors of the listing debutant, listing sponsors and any others who have authorized the issue of the listing prospectus have the potential to face up to three years behind bars. Other notable features include earlier filing of the listing document - not prior to the sale of new shares as is current practice but when the listing company applies to the stock exchange for approval to list. The core underlying message: listing sponsors had better conduct their due diligence properly and detect any risks before formally filing the companies for listing. Due diligence are investigations into business entities and people prior to a business transaction such as a merger and acquisition, joint venture and public listing. Listing sponsors are regulated firms representing and leading the IPO process and independent of the listing applicants. Hong Kong has recently lost its crown as the global top listing destination. With more than US$57 billion raised to top the world in 2010, it plummeted to fourth place last year and possibly this year based on its first-half performance. With Chinese companies increasingly going global, Chinese IPOs have regularly stolen the headlines globally as well as in Hong Kong - some 68 percent of IPOs in Hong Kong last year originated from mainland China. But Chinese IPOs have also been bad apples, with attention-grabbing "IPOs gone wrong" headlines. One of the biggest was China Life Insurance, which went public in 2003 on the New York Stock Exchange in what was then the largest IPO in the world. Shortly after, China's National Accounting Office accused China Life of embezzlement, illegal conduct on the part of senior management and a variety of other discrepancies. The resultant controversy drew a probe by the US Securities and Exchange Administration, driving the share price through the floor and sparking a flock of shareholder suits in the US. That effectively ended for several years any listings by Chinese companies in the United States until a scattered few did their due diligence properly. It also turned Hong Kong into the biggest recipient in the world of new listings until Hong Kong itself began to clean up its act on due diligence for IPOs. Stock market regulators generally agree that many such IPOs caused huge financial losses to investors and could have been avoided had the due diligence been thorough and proper. Going forward, listing sponsors have to beef up their due diligence on their listing clients but they face more headaches if they are helping Chinese companies to go public in Hong Kong. There are various types of due diligence, including legal, financial, environment and reputation due diligence. Each of these is conducted by respective professionals engaged by the listing sponsors to examine the listing applicants with a common objective: to find any red flags, if any, as soon as possible. Reputation due diligence falls under the domain of commercial investigations and business intelligence. Listing sponsors engage corporate investigators to comb data and identify well-placed sources to ascertain facts and claims made by the listing applicants and also verify any issues and concerns raised by the listing sponsors. After all, the listing applicants may not always be forthcoming with all the facts, especially any dark history that may hinder their aspirations to go public. In short, it is the process of finding out if the businesses and people on the other side of the table are exactly who they are and what they claimed to be. However, these investigative works are currently curtailed in mainland China. Mainland media have reported recently that scores of corporate investigators have been arrested after the Chinese government began clamping down on access to information, such as corporate and household registration documents that provide insights and confirmation about company structure, corporate history, the business interest of directors, etc. These are integral parts of any typical background checks and investigative works. It is anyone's guess if and when the Chinese government loosens up on its tightening of data access but don't count on the Hong Kong government to advise Beijing to reverse its course. Apart from bankers and listing sponsors fearing the violation of new rules on one hand and coping with the limitations placed on their due diligence process on the other hand, investors must now wonder whether any new Chinese IPOs will be properly scrutinized at all. Foreign companies, many of whom have strict corporate governance and compliance standards to adhere to back home, would also need to conduct proper due diligence prior to any investment. Hence the tinkering on data access is a shot on one's foot. It is not a conducive and sustainable scenario. Is Indonesia at a crossroads? Prabowo as Indonesia’s Next President? Who rules the airspace in Asia? Why Does Indonesia Need Apache Gunships? A Canadian military turn to East Asia? Manila, Beijing, and UNCLOS: a test case? Is the Indonesian economy in trouble?